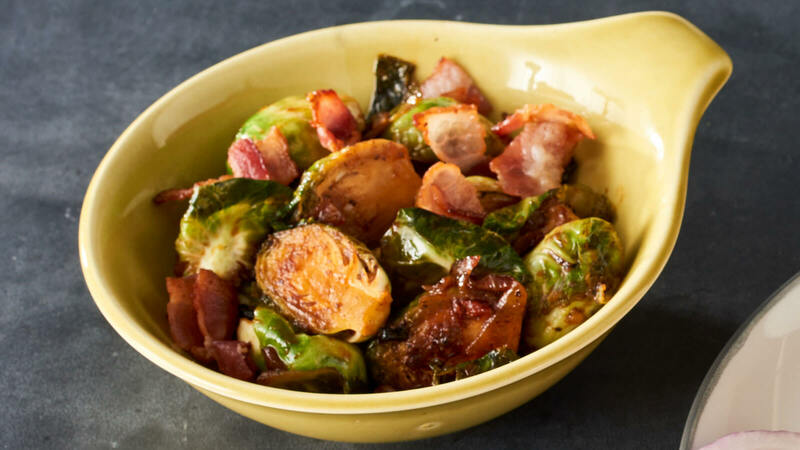 Toss the Brussels sprouts with olive oil and spice blend. Heat a large skillet over medium-high heat for 2 minutes. Add bacon and cook until crisp. Reduce heat to medium and remove bacon to paper towels, leaving remaining drippings in pan. Add Brussels sprouts and allow to brown 5 minutes per side. Transfer to a bowl and set aside. Add shallot and cook until softened, about 2 minutes. Remove pan from heat and add wine, scraping up any browned bits. Return pan to heat and add the Brussels sprouts and Rufus Teague Whiskey Maple BBQ Sauce. Bring to a simmer and cook until Brussels sprouts are tender and liquid has reduced slightly, about 7-10 minutes.